Steel poppet legs and cairn mark the site of the Garden Gully United Goldmine, which was re-erected here in 1931 to act as a lookout and perpetuate the name of Bendigo as a goldfield. The mine produced 444,336 ounces of gold. BENDIGO, Sunday. The steel poppet legs from the Garden Gully United mine, the gift of the Bendigo Amalgamated Goldfields Company to the city council, erected as a lookout tower on Camp Hill, in Rosalind Park, were opened yesterday by the mayor (Councillor W. H. Taylor). The tower is 65ft. high, and provides a commanding view of the city and surrounding district. On a memorial is inscribed the names of the late Dr. H. L. Atkinson and Messrs. I. E. Dyason, W. Hunter, George Lansell, and E. G. Mueller, who were directors of the mine. Gold produced from the mine was 444,336oz. and dividends paid amounted to £1,050,848 which is the best record of the mines on the Bendigo field. 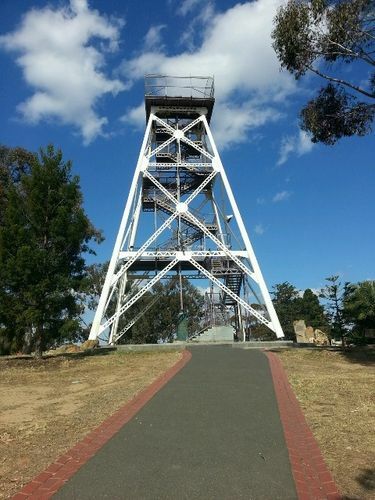 The mayor said that the lookout was erected to perpetuate the name of Bendigo as a goldfield. The wives of the directors of the mine who were pioneers of the gold-mining industry in Bendigo, had contributed generously to the monument. Mr. Angus Mackay, chairman of directors of the Bendigo Amalgamated Goldfields, said that the Garden Gully Limited mine had paid dividends regularly for 16 years. He paid a tribute to the pioneers for their great enterprise. Mr. H. M. Leggo remarked that if the Bendigo people would subscribe £1 for £1 on any subsidy made by the Government for development they would soon rehabilitate the industry. Mr. Lansell, M.L.C., expressed satisfaction at the revival in goldmining and said that there was every prospect of the industry being restored to its former activity. Argus (Melbourne,), 6 April 1931. POPPET LEGS OF GARDEN GULLY UNITED GOLD MINING COY. THIS MINE PRODUCED 444,336 OZS OF GOLD & PAID £1,050,848 IN DIVIDENDS. BENDIGO FIELD SINCE 1851 HAS PRODUCED 20.637, 223 OZS.